Today´s refined, processed, preserved, and fragmented foods have created deficiencies and chronic conditions that have significantly compromised our digestive systems. Many Americans over the age of 30 are unable to produce sufficient quantities of gastric acid and digestive enzymes to properly digest their foods – resulting in symptoms of indigestion. When foods are improperly digested, important nutrients are unavailable and can result in nutritional deficiencies. Furthermore, undigested food putrefies (proteins rot) and ferments (sugars and starches spoil) creating significant autointoxication (self-poisoning). 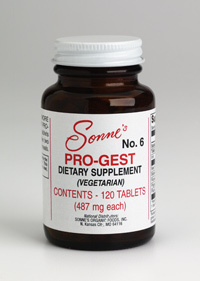 Pro-Gest is an excellent digestive aid for those who have difficulty digesting proteins. * Many people get wonderful results from its use. It is ideal for vegetarians because it contains nothing from the animal.